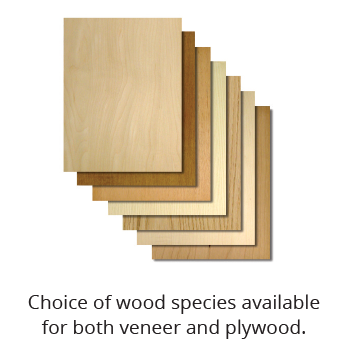 Plywood is available finished or unfinished. Hardwood veneers are bonded either to an all-veneer core or to a medium-density fiberboard (MDF) core. The MDF core provides a flat, stable surface suitable for paints and stains. Standard-size sheets (24” x 96” or 48” x 96”) or cut to any size. 1/4” plywood available in most popular wood species (unless otherwise specified, MDF core is used). 1/8” plywood available in maple, cherry, red oak, and white birch (veneer core only). MDF core is recommended for all finishes. Veneer core is recommended for stain only.